1. What is Fire Resistance? 2.Silicone cables don’t pass the fire test on one sample though do they? 3.Can I use red LSOH nylon cable ties FP? 4. What is the difference between Fire resistant cable and Flame retardant cable? 5.Which standards should I consider when choosing fire alarm and security cable? 6.What are some important safety precautions to consider when choosing fire alarm cable? 7.How can Low Fire-Hazard cables contribute to Fire Safety? 8. Is the quantity of cables installed in a construction relevant compared with other products? 9. Aren’t Low Fire-Hazard cables difficult to find and most of the time more expensive than standard cable types? 10. Do Low Fire-Hazard cables carry less current than standard cables? Is their capacity lower compared with standard version? 11. Do low fire-hazard cables cover the same complete range as standard cables ? 12. Which application can benefit from the improved fire performance of Low Fire-Hazard cables? 13. Cables are usually installed inside walls. Why should low fire-hazard cables be used? 14. 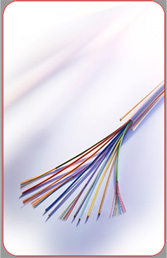 Low Fire-Hazard cables are not specified by any current Installation Standard or Regulation. Why should I install them?